A client has recently requested the ability to include the recipients local weather within their email template. Anyone have any idea how to go about embedding a widget like this within an email? Also RealTime email, lowest pricing tier is 15k annually. As Miah and Devon shared, MovableInk and LiveClicker have this functionality. I'd also put in a +1 for KickDynamic. Pricing models vary and it's based on the number of opens. You actually won't need to already have the user's location, as it will do a basic IP detection upon open and serve the corresponding forecast. We did something similar with a client recently, but they had a very tight budget (i.e. no budget) so what we did was send that information over to their ESP from their site, of course this was only usable at the time of opt-in. 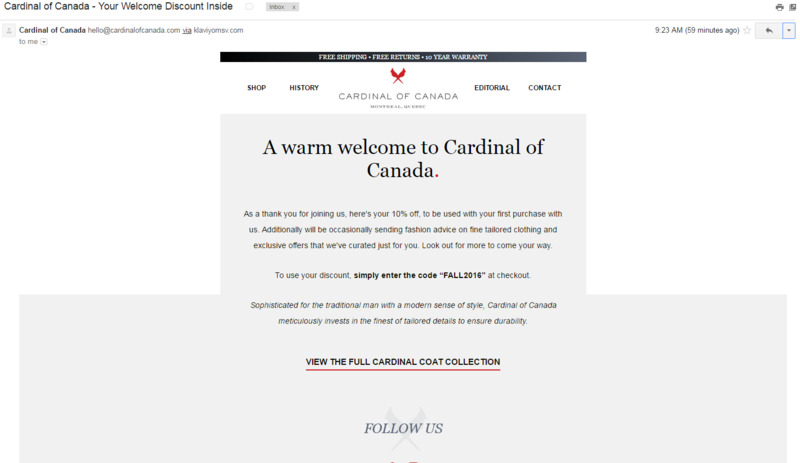 They've played around with the original concept on their own since the launch, I not sure I like what they're doing, but if you go to cardinalofcanada.com and wait for the popup, you'll see the weather information on the popup and then when you opt-in the welcome email you get has the weather data included in the email and displays a couple of coats appropriate for your winter climate. So I just tried it out. On the webpage, it said that temps could go down to 29F...I dont think that's happening anytime soon in LA! Now that I got the welcome email, I looked inside but didn't find any weather or coats. Also, looking through the markup, I see a section commented out. This could also explain why the bottom section bleeded outside the width. amount in the coming weeks. Yeah, I'd advise going for Miah's link as I'm not aware of a company which provides this service. There are plenty out there offering a similar service for countdowns etc though. But in short, they'll provide a link to an image which you include in your email, I imagine you'll need to have the users City in a Field of your database, and then include this field as part of the image link string. The company will then supply each image as per the additional City information in the image source link. They'll probably charge you per subscriber... but I'm just speculating.